What is CAVV Authentication Verification Value? Cardholder Authentication Verification Value, or CAVV, are potential responses for customer initiated Visa debit and credit card transactions where the Verified by Visa, or Vbyv, authentication method is used. E-commerce, online payments, and Electronic Invoice Presentment & Payment (EIPP or EBPP) are all solutions in which a customer can participate in self-authentication. How does CAVV impact interchange rates, the bulk of credit card processing fees? To qualify for CAVV interchange rates, merchants must register for Verified by Visa through their merchant services provider, and must use a payment gateway that supports the service as part of the transaction process. In addition, other rules apply such as settlement time and more; the latter part can be managed automatically with an intelligent payment gateway. The best Visa Card Not Present Key entered transaction credit rate is 1.80%. The same Visa transaction as above, but with a valid CAVV response is 1.70%. How does CAVV impact fraud risk? If a passed validation response is returned, then fraud risk shifts to the card issuer. Responses other than ‘fail’ may warrant additional scrutiny as part of a layered approach to mitigate fraud risk. Note, other card brand authentication terms are AEVV, American Express Verification Value and MasterCard Universal Cardholder Authentication Field (UCAF™). All of these, including VbyV, use the global standardized 3-D Secure XML security protocol. Payment gateways can implement 3-D Secure in different ways, which can potentially impact profits and risk. For CenPOS solutions to enable customer cardholder authentication, including payment gateway, contact Christine Speedy today. Not all solutions work alike, contact an expert. What payment gateways support level 3 processing? 2014 level 3 payment gateway comparison chart. Click image for PDF. 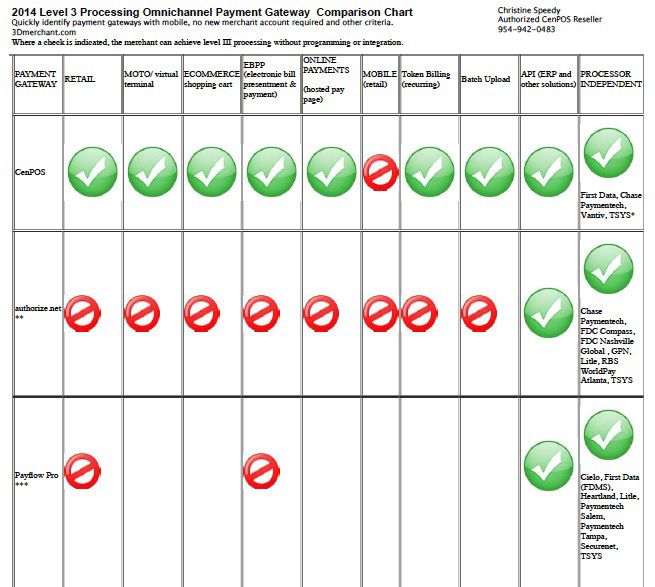 2014 comparison chart review of payment gateways that support level III data and whether or not the gateway is independent of the merchant account. Reviewed are authorize.net, CenPOS, Paymentech Orbital, First Data e4 Global Gateway, PayTrace, Payflow Pro, 3Delta Systems (3DSI), Paymentech Orbital, and Heartland Payment Systems. Where a check is indicated, the merchant can send level III data without any special programming or integration (except API). However, a merchant might achieve level 3 processing in another category by using an API. The payment channels reviewed include retail, moto, ecommerce shopping cart, electronic bill presentment & payment (EBPP), online payments (hosted web pay page), token billing (recurring), API (ERP and other software). Also indicated is whether a new merchant account is required or which merchant processors the gateway is compatible with. Paytrace: TSYS, Paymentech Tampa, Global East, Heartland, and Trident. * Think of TSYS as a hub that provides access for transactions (traffic via payment gateway) to many highways (processors). By going through the hub, a payment gateway can securely connect to many processors (Global, Heartland, First Data etc) with one certification. Some merchants may incur a per transaction fee for using a payment gateway that connects via TSYS; this may or may not be additional to fees already being paid. DISCLAIMER: If the information was unclear or not available, the field was left blank to err on the side of caution. Contact processors or payment gateway providers for specific details about availability and functionality. 3D Merchant Services is an authorized reseller for CenPOS, and most payment gateways, in addition to other services. MOTO: mail order, telephone order. This is a transaction indicator code for card not present transactions. EBPP: electronic bill presentment & payment. A merchant delivers an electronic invoice to their customers. The customer then pays the invoice electronically. LEVEL III data or level 3 data: refers to the additional field data sent for processing Visa and MasterCard business, corporate and purchasing cards. What’s the difference between level 3 and level III? Nothing. In 2014, and recent documents, interchange rates are more frequently referred to as level 3. However, in older documentation and marketing materials, the requirements and other items referred to it as level III. It’s critical to note that the CAPABILITY of sending level 3 data via a payment gateway, does NOT guarantee that the transaction will qualify for level 3 interchange rates. There are many rules, and how the gateway helps a merchant meet those rules varies widely. For a free consultation on key operational differences between level III gateways, contact us. Now 2013, some merchants are experiencing issues related to the revised MasterCard and Discover 2010 Prepaid and Debit Card Requirements, particularly partial auth reversals. One reason is that some transactions received a partial approval. A partial approval occurs when a Gift Card is used (Visa/MC/AMEX prepaid cards) that have a lower balance that the requested authorization amount; the processor approves the transaction for the amount that is left on the card. The merchant then must collect the balance with an alternative payment source such as cash or another card. Partial Approvals—Merchants can systemically conduct split-tender purchases by allowing debit card issuers (including prepaid) to systemically approve a portion of the original transaction amount in the authorization request when the transaction amount exceeds the funds available on the card. The merchant can then systemically initiate split-tender processing and obtain the remainder of the purchase amount in another form of payment. Balance Response—Prepaid issuers can transmit account balance information in an authorization response, cardholders will attempt fewer purchases that exceed their available balances, leading to fewer declines at the POS. Authorization Reversal—Authorization reversals will free up debit cardholders’ open to buy amounts by reducing issuer holds on available balances when transactions were not completed, therefore reducing the declines at the POS and the amount of cardholder complaints that are unpleasant for all parties involved. At the time the rules were created, technology within various points of the payment processing ecosystem could not support the new requirement. Payment gateway and processor issues have largely been resolved at this point, but partial authorizations may still be troublesome in certain environments. For example, an ecommerce site or POS software solution may not have the logic to accept an alternate payment source. If you have an issue, the simplest immediate solution is to contact your credit cart processor and ask them to turn off partial authorizations on your merchant account. That’s the quick fix, however, if the rules apply to your business, you may need to update your payment technology to comply. Refer to page 299 in the MasterCard Rules, updated December 2012, for more information on Full and Partial Approvals and Account Balance Responses. About Christine Speedy, blog author. Christine is an authorized reseller for CenPOS, a cloud payment processing suite of solutions that creates numerous efficiencies for merchants. The CenPOS point of sale, mobile app, and other solutions support partial authorizations and authorization reversals. Global Sales: Christine Speedy (954) 942-0483.